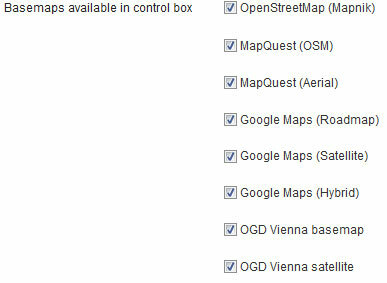 Please note, that already existing maps with visible controlbox also get these new entries (which might not be a problem, just wanted you to know in case you configured your controlbox to only show specific basemaps). Everything else is just as you know it from Leaflet Maps Marker before: create a new marker or layer map and select Google Maps if you like. Default basemap is still OpenStreetMap, but I believe that users should have the choice if the like to use Google Maps. I also updated the translations strings to include the texts from the update notice shown after each plugin update. A small change for the widget introduced in v2.4 – if you use this widget on your site and no marker has been created yet, the message “no markers created yet” will be shown. Well – you should always test, test, test new releases 😉 By chance I discovered, that v2.4 broke WordPress installations from 3.0 to 3.1.3. This is now fixed and everything should work as designed. Nethertheless if you use old WordPress versions I strongly recommend updating to take full advantage of all plugin´s features. For example, since 3.3 my plugin uses the TinyMCE editor API which also allows file uploads as you know them from the posts edit screen. A small bugfix for legend links on active WMS layers which were broken. Another nasty bug causing maps to break if you used \” in popup texts on layer maps. Now ” gets replaced with ‘ on layer maps, so inserting \” as popup text works again.